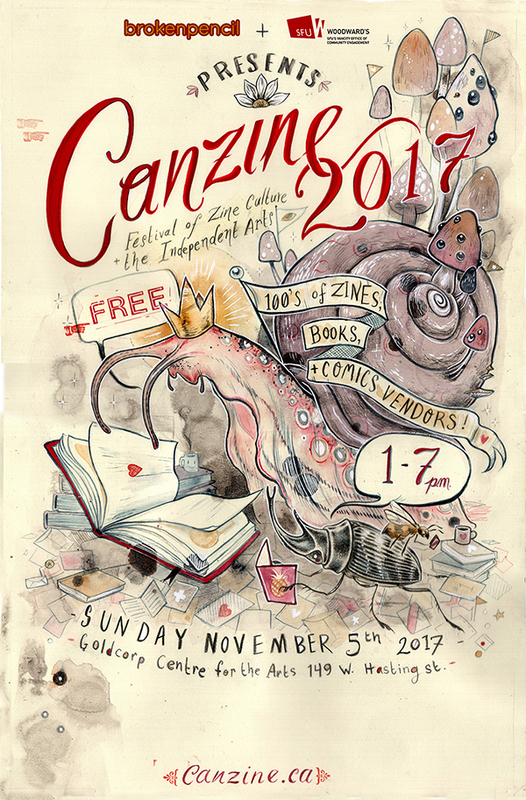 Come to SFU Woodward's (149 W. Hastings St) this Sunday, Nov. 5 from 1-7pm for Broken Pencil Magazine's Canzine Vancouver 2017 fair. Browse hundreds of zines, books, comic, and small press vendors for available for you to trade, buy, sell, browse, chill, and enjoy! - A panel discussion on feminism, witchcraft, and the occult in the indie arts with Adriana Lademann, Miki Aurora and Caitlin ffrench. - A zine party and artist talk by Tahltan First Nation comic artist, illustrator, printmaker Cole Pauls, creator of Pizza Punks and Dakwäkãda Warriors. Admission is free. Visit canzine.ca or the Canzine Vancouver 2017 Facebook event page for more Canzine info!